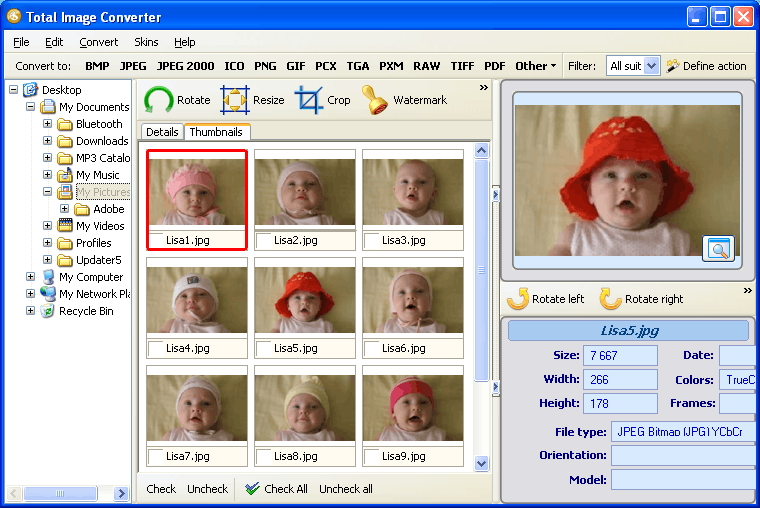 PSD (Photoshop Document) is a lossless compression image format. PSD files have additional color, contour, etc. information. Due to the large amount of information and multi-layer structure, PSD files are hard to transmit online and therefore have to be converted to more portable formats. TIFF (Tagged Image File Format) is one of the earliest and still most popular image file formats. It does not contain any text or vector data, and it is used for bitmap data. This is a platform-independent and flexible format, and it is supported by all professional image editing applications. There are lots of TIFF converters that can render PSD files in TIFF, but very few of them can convert PSD to TIFF in batch. If you are looking for a handy and easy-to-use software utility featuring batch mode, there is an excellent solution. 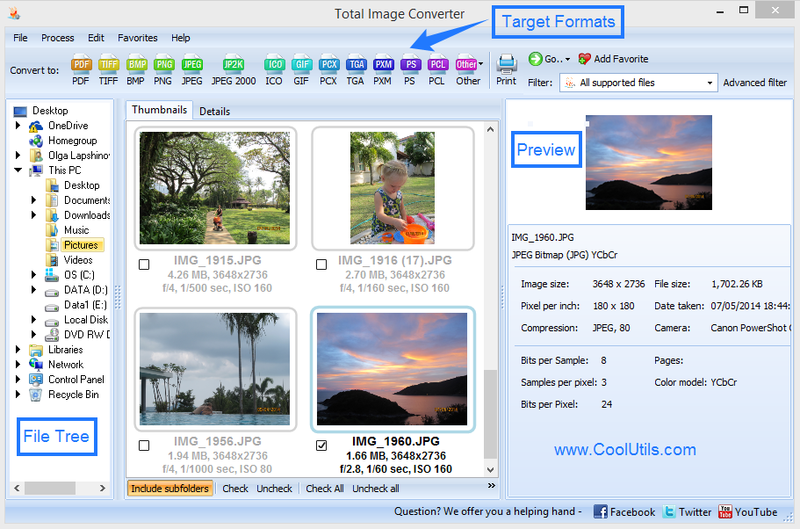 Total Image Converter is the handiest and most flexible PSD converter you have ever worked with. It has a robust and user-friendly interface, and you are not going to have to spend hours learning how to handle the tool. 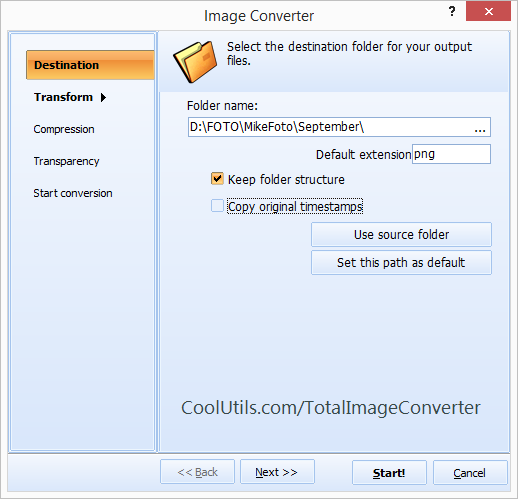 Total Image Converter requires little action on your part. Actually, all you need to do is select and click. The wizard will help you specify your settings. You can either use the default settings or make your own settings. Now, let's get down to business. How do I convert PSD in batch? It is the easiest job I have ever done! Actually, the program does the entire job for you! What I do is select the folder with PSD files contained in it, check as many files as I need to convert and click TIFF. The wizard guides me safely through the process, steering me down the right path. I can switch on the built-in viewer and check the quality of both the source image and the target image. Also, I can resize, rotate and crop files. 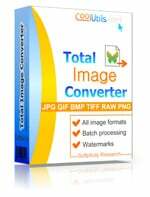 Total Image Converter is not only the handiest image conversion tool. It is also the cheapest one, at least among those trying hard to hold a candle to it in batch-conversion. It is worth only $24.90 and it is available for online purchase. Buy it right now and ease your work! You can also download the trial version, which is valid for 30 days, and have a little bit of practice.